Samhain. All Hallow’s Eve. A holiday that allows the Underworld to open and the creatures to pour out. Undead For A Day . . . a trio of stories from three paranormal romance and urban fantasy favorite authors. Raising the Darkness by Chris Marie Green: It seems that someone has sent dark creatures after former hunter Dawn Madison (Vampire Babylon), and they’re out for blood. Into the Fire by New York Times best-selling author Nancy Holder: Caught in the middle of a feud between rival magical Houses, Bridget Flynn raises a battle force of her own, and tries to survive the hot-tempered witches intent on destroying each other. 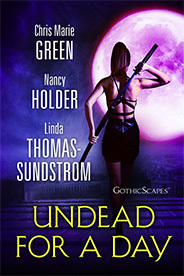 Trapped in Stone by Linda Thomas-Sundstrom: The forces of Good and Evil are playing a game of chicken with one man’s soul atop Notre Dame Cathedral in Paris, and the woman he loves has vowed to help him. The holidays have never seemed so . . . strange.